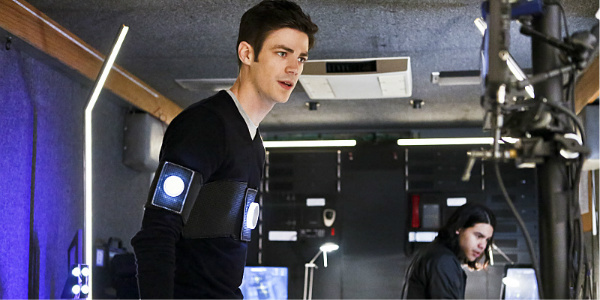 Spoilers for tonight’s episode of The Flash reign supreme in this article. You’ve been warned. Well, Barry and Team Flash have gotten themselves into quite the pickle now, haven’t they? Zoom has continued to work his way through a takeover of Central City by forcing the police to abandon the station that Joe works from, and then killing a room full of cops (and one poor cameraman). Cisco met his brother Dante’s evil Earth-2 counterpart, Caitlin is still kidnapped and Iris finally told Barry that she’s ready to make a go of things in the romance department with him. Then, of course, Barry agrees to let Harry recreate the particle accelerator explosion, and things go all scary and screwy for everyone involved. With everything that happened in tonight’s episode, it’s hard to believe that there could be anything else to remark on, especially since there was a bit of major, super important info that was completely overlooked by Barry immediately after hearing it. Apparently, Barry’s paternal grandmother had the maiden name of…wait for it…Garrick. Oh, yeah. That’s right folks, Barry Allen has Garrick blood running through his veins. Now, before we get to the implications of this reveal, let’s go over the moment when we find out this little tidbit. Right after the team celebrates their HoloFlash victory, Barry takes a trip to see his dad at whatever non-creepy cabin in the woods he’s been hiding himself away in. When Barry and Henry go inside and sit down to have a talk about what’s been going on, he mentions Jay’s full name to Henry, which makes him do a bit of a double take. That’s when he spills the details of his mom’s original surname. And, what does Barry do? Nothing. He just keeps on rolling with his tale of how Harry plans to blow the accelerator again. Um…Dammit, Barry! Haven’t you been paying attention to Season 2 of The Flash? That was important information you just completely ignored! What does this mean? Obviously it’s not a coincidence, like it would likely be in real life. Barry pretty much has to be related to, and very connected to, the Earth-1 Jay Garrick. Why doesn’t he know him? Was the Garrick side of the family estranged from the Allen side? Or did they just seem to fall off the face of the Earth? Also, what does this mean for the identity of the man in the mask? Is it the real Earth-1 Jay Garrick? Is it Earth-2 Henry Allen? Is it Barry’s great-grandfather? They’ve been teasing us with possibilities and now my Flash loving brain is in overdrive. I think this is the best and biggest clue that The Flash has given us for who’s in the mask. What do you think? Let us know in the comments below.